What you don’t invest in is as important as what you do. Over the past few months South Africans have enjoyed the bounce in confidence brought about by changes in the country’s politics. The rand has strengthened, bond yields have come down, and the country has become a far more attractive place in which to invest in a very short space of time. There have been some positive moves in the equity market as well. The Banks Index has gained over 22% since the start of December, with Standard Bank and FirstRand showing particularly strong gains. Retailers have also been given a boost, with the General Retailers Index having gained over 20% in three months. 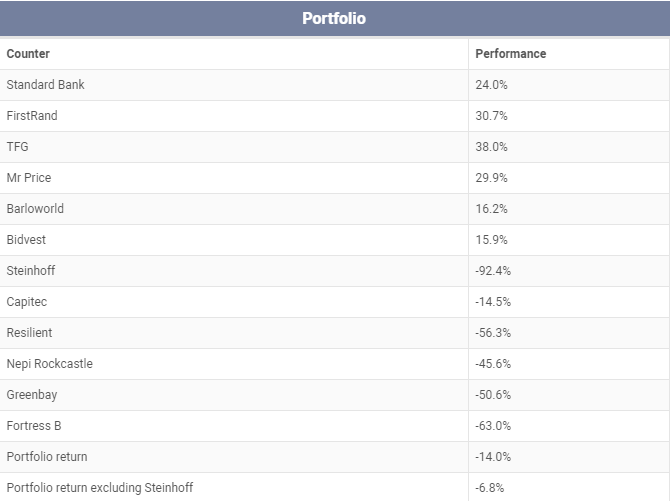 The Foschini Group has shot up over 60% since the start of November, with Mr Price not far behind. Some industrial counters with significant exposure to the South African economy have also picked up. Barloworld and Bidvest have both gained a little over 15% in the past three months. Despite these impressive gains, however, the biggest stories in the local market have been about stocks that have gone the other way. The attention has been on Steinhoff, Capitec and the Resilient group of REITs. Steinhoff’s share price is still over 90% down from where it was trading in the week before Markus Jooste resigned, while Capitec has shed 20% since the release of the first Viceroy report. 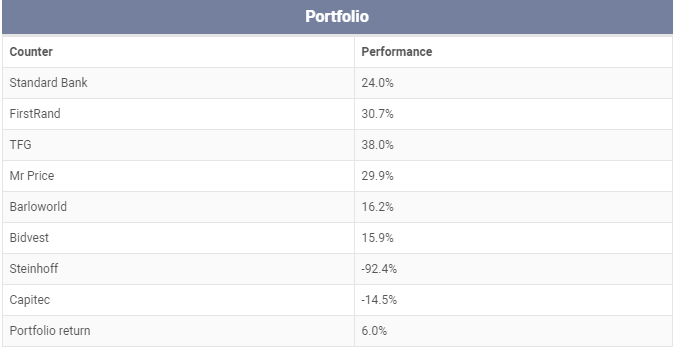 Among the Resilient group, Resilient itself is off nearly 60% since the start of 2018, Nepi Rockcastle and Greenbay have shed over 45%, and Fortress Income Fund B is down over 60%. For investors, it’s worth thinking about these ups and downs in the context of a portfolio. The reality is that if at the start of December anyone had held an equally-weighted portfolio of the 12 stocks mentioned above, they would now be substantially worse off than where they began. The losses from the poor performers would have more than wiped out the gains from those that have done well. This would be the case, even if one excluded Steinhoff. While it’s extremely unlikely that anyone actually held this portfolio, it does reveal a very important lesson for investors – picking stocks that benefit your portfolio is only half of the battle. You also have to avoid the ones that will hurt it. Of course this is easier said than done. In the case of Capitec, for example, while you could argue that the company was over-valued, nobody could have foreseen the release of the report that caused the sudden drop in its share price. Steinhoff and Resilient are, however, slightly different. While perhaps nobody anticipated the extreme drop in their share prices, plenty has been written about the warning signs that suggested that things were not quite as they seemed. It’s easy to miss these indications when shares are performing strongly, however, and that was certainly the case in both instances. When a share is going up, our natural biases will be to believe that it will continue to do so. For investors, the vital thing is always to go back to the fundamentals. In the case of Steinhoff, where were the cash flows that should have been coming in? For Resilient, what was underpinning the large premium at which these companies were trading at to their net asset values? Nobody will always get every investment right, and even professional analysts sometimes miss what in hindsight seems obvious, but a process of analysis is the only way to get the odds in your favour. You only have to get more right than you get wrong. Consider that if you just exclude the Resilient group of companies from the above portfolio, its performance turns positive. This is even despite the drag from Steinhoff. Of course, it’s not just stocks where this matters. It’s important to consider the fundamentals of any investment so that you can avoid those where the odds of making money are not in your favour. Anyone who thinks that they have invested in bitcoin should perhaps give that some thought.